Human bodies don’t normally fly through the air, and I didn’t expect a real life lesson in normalcy bias, but last year that’s exactly what I witnessed while waiting for a red light to turn green. I was sitting in my Tahoe at an intersection not far from home when I heard the loud rumble of a truck engine. I couldn’t quite believe my eyes when a green pick-up veered around me, raced into the intersection and plowed into a white sedan. While my mind was registering this violent accident, I saw a scarecrow fly through the air. I took a few deep breaths, tried to remember the details of how the accident happened and waited to give my eyewitness account to the police who appeared on the scene within minutes. My mind re-played the scene, always with that scarecrow flying out of the truck and into the adjacent field. It wasn’t until a half hour later, when I saw EMTs trying to revive a young man did I realize that what I had actually seen was his body at the moment it was ejected from the front seat. Even now, when I remember the accident, I don’t see a human. Instead, the image of a scarecrow is imprinted in my brain because humans don’t fly through the air! This is an example of Normalcy Bias, a survival mechanism our brains are equipped with that can place us in grave danger when we’re faced with something traumatic. 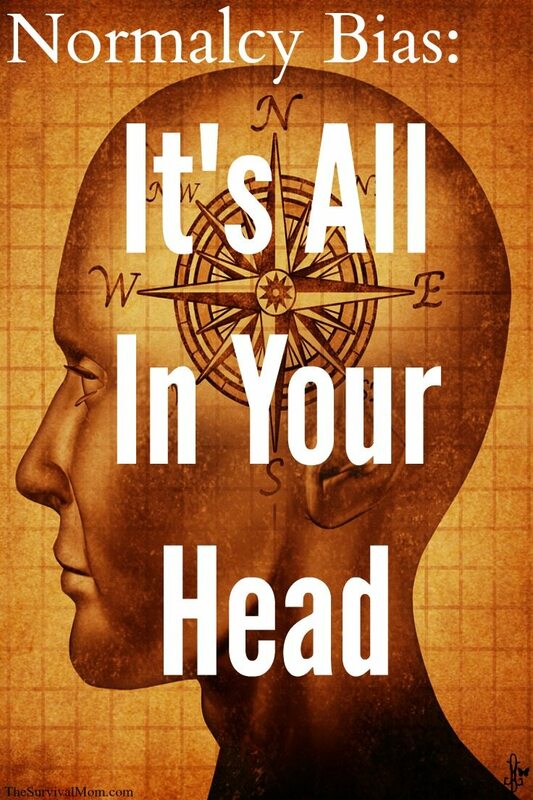 Simply put, it causes our brains to insist that all is okay. Everything will return to normal. For most of us who have never faced true peril, Normalcy Bias tells us that nothing bad will ever happen. “This is America!,” some people insist when I tell them about the possibility of a deeper Depression or hyperinflation. Incredibly, the most obvious warning signs are ignored. This explains why so many Jews continued living in Germany, even after they were forced to wear identifying yellow stars and discriminatory laws were passed against Jewish people. Life had been so good for so long that, surely, things would get better. Jews who could have easily afforded to move out of the country stayed, and perished. Oncoming hurricanes and similar disasters elicit similar reactions. We simply expect life to go on as it always has, and our brains are wired to accept that and nothing else. A driver attempts to cross a flooded river. Thousands of New Orleans residents faced with Hurricane Katrina refuse to leave the city, and city officials don’t even make an attempt to evacuate them. One survivor from 9/11 tells of going blind as she saw dozens of human bodies hitting the ground outside the Twin Towers. Our brains can accommodate billions of bits of information each day, but apparently, there are some things too terrible to comprehend. Those of us who believe in preparedness, whether beginners or veterans, know the frustration of trying to convince loved ones that the future is not at all secure, but the Normalcy Bias isn’t something we can debate. It’s not based on logic or rational thought. It’s the brain, doing its best to help its human owner deal with terrifying events and possibilities, as well as with escalating situations whose logical, final outcomes can’t be accepted. If you had told me that American citizens would meekly line up to walk through powerful x-ray machines that would strip them bare before low-level TSA employees, I would have said, “Never!” If you had told me that, as an option, they would stand with arms raised while their crotches were groped and would allow their pre-schoolers to be similarly molested, I would have laughed. Yet, that is exactly what happened, and not only do Americans meekly put up with this but they defend it. The water is heating up and most of the frogs are oblivious. Each week brings another repressive ruling, and still, most American citizens insist there is no reason for concern. New legislators will make everything right again. This is just temporary. Whatever comes next will, again, be excused and accepted. Darn that Normalcy Bias! Here’s the bottom line. 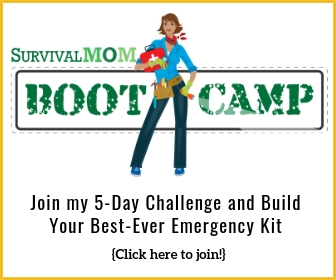 As Survival Moms, we don’t have the luxury of looking at a catastrophe before us and saying over and over again, “I can’t believe this is happening. I can’t believe this.” If our kids can’t rely on us when all hell is breaking loose, then who can they depend on? Law enforcement and first responders are quickly overwhelmed, and your family is hardly at the top of their list. Normalcy Bias can place those we love most in grave danger. I think a conversation about overcoming Normalcy Bias will be important and valuable in the Comment section following this article, but here are eleven ways we can begin to condition our minds to accept the unacceptable. Face facts, don’t hide from them. Confront financial difficulties, acknowledge your limits. Only when you face reality can you prepare for it. Trust your instincts. Headlines change on a dime. Take in a much bigger picture than a single, optimistic headline or the words of a politician seeking re-election. Trust your own five senses and what your gut is telling you. Fight feeling overwhelmed with lists and organization. Focus on what you will do today, this week, this month. Little by little it will all come together. Reach out to others. 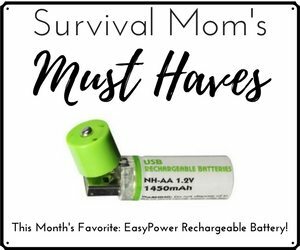 Start your own Survival Mom meet-up group. Spend time on preparedness and survival forums, as long as they don’t feed your fears. If there was ever a time for people to come together, this is it. It’s better to over-prepare than to be under-prepared. Normalcy Bias assures us that everything will be okay. A few extra bottles of water is all you really need. Those ten cans of tuna will be plenty! Go ahead and stock up more than you think you’ll need to. Make plans for scenarios that may be a bit far out but still within the realm of possibility. Make plans. Have an evacuation plan, and prepare for it. Have a hunker-down plan, and prepare for it. Decide ahead of time how you will face the most likely crises and communicate those plans with those who need-to-know. Write down your plans! Panic and stress have a way of erasing the logical parts of our brains! Be ready to act quickly and decisively. It’s better to take action too soon than too late. Take time off. Forget you ever heard of the word, ‘preparedness’. Go shopping and blow a few bucks on something completely unnecessary. Go out to lunch. Play with the kids. Spend an hour on the phone gossiping with your best friend. Give yourself a mental break! Your family needs you to be strong. You need to take care of yourself, body, soul, and spirit. Get physically fit. There is a huge connection between physical and mental fitness. Start with some sort of exercise and start today. 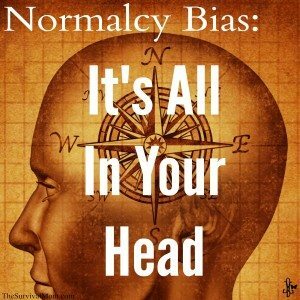 Normalcy Bias, although deeply ingrained in the human brain, doesn’t have to control our futures or place us in harm’s way. The first step in being prepared is becoming educated. Knowing about this bias, what it can do, and how it can be controlled will help you become a Survival Mom in every sense of the word! This article was slightly updated on April 28, 2015. Excellent topic. Experts tell us, that when faced with an emergency, there are two instinctual reactions; fight or flight. I insist there is a third; freeze. Too many times I've seen people stand around like sheep with no reaction at all. Blank faces and frozen limbs at car accidents, house fires, etc. We say Hero when someone dives into the fray with no pause, and so we should. This is someone who has overcome the normalcy bias. It is really rather rare. From horse training i know the whole list is flight, fight, freeze, faint. Goes for people too. This is a great article.Thank you for continuing to thump us on the heads and force us to think about preparedness. I have slacked off a bit myself. You are right, Americans have had it easy, so preparedness is not in their vocabularies. My heart goes out to the people in the snow ridden northeast and southeast and the Californians who lost everything in the mudslides. Some of them barely saved their own lives to escape the disaster. I kept wondering, "How many of them had their BOB ready to grab on the way out the door? or had extra snacks or a bottle of water in their purses or backpacks when stuck in a subway for 7 hours or in a car on a frozen highway for a few days?" Complacency will be the downfall of Americans. Their brains can't ever imagine something terrible happening, so why prepare??? Try convincing people to be prepared in Dec. when it's 84 degrees and sunny with the trade winds blowing!!! 🙁 Thanks again for reminding us to stay on top of our game! Great article. This perfectly describes too many of our family and friends. They want to pretend that nothing bad will ever happen, and that life will continue to be "normal" forever. I've been told that hyperinflation is a pessimist's attitude. I'm sure the people who endured the Great Depression or the collapse of the Weimar Republic wished someone has sounded a "pessimistic" warning! My grandparents and my mother and father and their siblings were all adults during the depression and survivied it as a family working together helping each other. I was born not long after the great depression and the depression was such a significant part of my families life that it was a subject of conversation around the dinner table. I asked many questions many of which were undoubtedly stupid questions. Not all the answers were good either. Everyone's impression of the depression depended on their personal experience and not every answer rang true or made sense. In retrospect, it's easy for us to ask why someone didn't act a certain way, and you give a great example! I've wondered what life will be like at this time next year. What will our Christmas be like? It's sobering and not exactly the cheeriest way to live, but I'd rather face reality that live in denial. Lisa, This is your best article yet! Thank you! I agree with Barbara, flight, flight or freeze….Hopefully, with the lessons and articles you print, we will all be better prepared and better able to help our families. God help us all…..
First time poster here. I have been lurking for a couple of months (ever since seeing you on Glenn Beck). I really enjoyed this article and have learned so much from your site in the time I've been reading it. I've recently relocated to Gilbert, AZ from MD so that we could be near our family. I have had a strong feeling for the last 5 years that things in this country would be changing dramatically and have (slowly) been trying to get prepared for the worst. 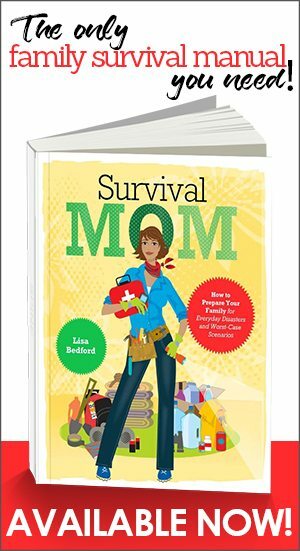 I saw something in this article that caught my eye that I wanted to ask you about–survival mom groups. Being new to the area, I don't know many people, other than family. Do you know where I could find a group of like minded women near me? Anything you could offer would be greatly appreciated. Thank you for all that you are doing to help more of us become Survival Moms. 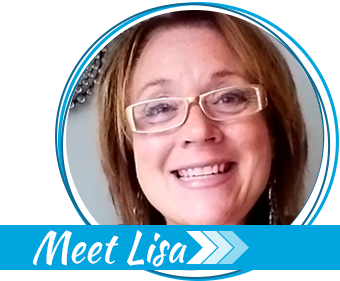 Lisa, it is a timely article. Lately I've been feeling a sense of urgency with regard to my preps and have those heart pounding moments of anxiety(it could be caffeine!) and wonder if what I'm doing is enough. We've all been conditioned to think that there will always be a safety net if our lives become intolerable and realizing that there is no net can throw us into a tailspin of uncertainty. Thanks for getting me back on track and helping me remain focused. Good article. I can't argue with the points you make, especially about airport security (I and my family aren't going to fly again until that changes, if that be never then so be it). Kinda makes you wonder what "normal" will be in 10 years! Inspite of these points, there is *always* someone sounding an alarm claiming this or that is on the verge of happening. And the proverbial "this time it's different" explanation is given as to why they should be listened to. In the 70's and 80's thousands of people prepared for a nuclear war with Russia. Didn't happen. Might have, but didn't. Then there are the people who have been claiming 'race wars' are about to come (for the past 40 years). Hasn't happened inspite of sometimes poor racial relations. The reality is preparing takes a great deal of time, effort, and money that otherwise might be put towards living other aspects of your life. IOW, what will you be missing out in your life while spending time and monet preparing for "what if"? I am not arguing against preparation. But the costs (in every sense of the word) have to be recognized as well as seperate what is "possible" from what is "likely". So does making dinner and cleaning the bathroom. Because we have preps, we're rarely "out of" something and have to stop in the middle of a project to race off and get that item. It lets us actually live more in the moment, since we have spent past moments preparing. Yes, like all the time preparing for Christmas morning or a wedding, there is a lot of effort to get to that point, but it's rewarding. And unlike Christmas morning or a wedding, the benefits are (or should be) long-lasting. If I told you to,would you go this Monday morning & cancel all of your insurance on everything ? Your life, medical, your home, each one of your vehicles, all of it–evrything concerning insurance; even on each child, relative–whoever! Then I would tell you not to worry, nothing can possibly happen, that the Government can't take care of & fix for you & your family. Just sit back & wait & see. How much of the above statement would you agree with? & why, if any. As a retired Engineer from the Nuclear/fossil energy Divisions, I estimated, planned & scheduled project work & job activities. Each activity required a "what if" and I was resposible for furnishing two alternatives/options. You don't get "second" chances in the Nuclear Field. Fortunately, nothing serious ever happened, but there were many close calls AND a lot of "LESSONS LEARNED"! Balance your scales my friend, balance them fairly & apply the ol' common sense, that walks hand in hand with "what ifs". Why would it be necessary to compromise any aspect of your life while preparing for those "What ifs?" A balance can be found. Being prepared is not a new idea but one that evolved from previous generations. One only needs to look at Katrina and the aftermath to understand these things happen. The water main break in MA last year that affected 30 communities or the horrific ice storm the winter before last around my area in MA that caught many towns unaware: no generators, water, heat. When I read that the average American family does not have more than a week's worth of food in their home and when I see on the news that people were going out in our last snow storm here in MA because they have NO food, clearly there are a few mind sets that need to be changed here. We recently sold our back up generator to one of our neighbors because, by his own admission, he's been "rolling the dice" for the past five years. He's got an oil furnace and a pellet stove, both of which rely on electricity. He's got 4 kids under the age of 7. Lynda – In your specific geographic location perhaps a genie is a good idea. In mine, may not be so urgent. Nice to have but not urgent. In fact I just saw a good portable genie on sale at Costco for $800. Wouldn't mind buying it (though the wife would probably kill me). But here's the reality check – In all our years of living in our house at the most we've only been w/o power for a few hours. And a power loss in general is very very rare (maybe three times in the last 7 years). So I can spend $800 on a genie or spend $800 on something else for my family. Or just save it in the bank. It's "possible" we may have a longer term power loss. But is it *likely*? Using the logic of not preparing for possible scenarios does not make sense to me and although we are free to choose which "insurance" we buy I'd prefer to have that spare tire, generator, house insurance, security system and health and life insurance for those "what ifs." For example, auto insurance is mandatory in MA. Does this mean that I'll get into an accident? No, of course not. Even if it weren't mandatory I'd still pay those premiums. My neighbor did purchase our older generator for pennies on the dollar. During the few times we did lose power, I was able to power our fridge, freezer and the house. He, on the other hand, had to move his family to a relative's house and with 4 young children(the most recent is 6 mos. old) this is inconvenient. Unfortunately for him, he has a pellet stove and oil furnace, both of which require electricity. I'll take my insurance, food and water storage and my preps any day over an exotic vacation, bling or keeping up with the Joneses. As well as staying completely out of debt. But, to each his own. Useful key phrases to put in your search engine to apply preps to daily living are "risk assessment" and "hazard vulnerability analysis." Identify hazards are most likely in your area, impose the greatest risk, examine the consequences of those events on your family and plan to mitigate those. Winter storms, tornadoes, hurricanes, floods, and transportatiopn accidents happen everywhere. They may cause loss of AC power, resource shortages such as loss of AC power, municipal water and disruption of food and fuel supplies. These are more likely than a terrorist nuclear detonation in your neighborhood. Plan beyond the recommmended 72 hour window. Instead work towards at least a week (or more) of family self reliance. This will keep you in good order for common emergencies. Only then concern yourself with the low risk events of high consequence. Years ago I heard a VietNam vet on NPR give an account of how his best friend in the war was blown up in close proximity to him, I believe from a land mine. A medic, or officer, came running over to attend to the hunk of human flesh. The speaker of the story said something along the lines of "why are you attending to that tree trunk?" In other words, his mind tricked him into thinking his best friend was simply a tree trunk in order for him to cope with the situation, and he simply didn't see a human, just like your scarecrow. The mind is amazing. Thanks again for the post…can't wait to pass it along! I sometimes feel an urgent need to prepare. Living in Hawaii we have constant emergencies looming; earthquakes (one damaged by home several years ago), tsumis (had to evacuate two years ago), brush fires (smoke damage from one too close to home), so these threats became reality to me. I've always tried to be prepared but no I'm not as prepared as I should be. When I tell my daughter and her husband to buy extra food, TP and water they look at me like I'm kind of crazy, as do most of my friends. Now I keep my craziness to myself, but still try to prepare. I agree. Just learned the term recently; but have been cognizant of some things being very wrong for a number of years. Great post, thank you. I've been reading a lot about the normalcy bias lately. I agree with all of your tips, especially number 10. We need to be grateful for what we have today and not take anything for granted. Realizing certain facts and the direction of this country are certainly hard to cope with at times, but we need to appriciate our fortunate pasts and take advantage of our near future until things become even worse. One of my favorite quotes relating to this situation is by Harold Stephens: "There is a great difference between worry and concern. A worried person sees a problem, and a concerned person solves a problem." I think our family fell into a form of this, I suspect others have as well. My husband had been laid off from his company and from his very good job. We truly said to ourselves, “we’ll be back to work in no time at all, this is just for a few months.” No, it was YEARS. Years of hard times and struggles, working many different low pay jobs to simply get by. We received a settlement and it would have been to our advantage to prepare for the worst case scenario. I was taught in nursing school when we dealt with emergencies to think of the worst possible scenario and make a plan for it. For us, we just couldn’t wrap our brain around how deep and severe the hard times were going to be. Thankfully, we made it through it, but we learned a few valuable lessons in it. Your like the “Sarah Conner”of moms. Excellent article!…..I know SO many of these people, and I doubt that I will evere get through to them…. I’m also having the same issue as others have described – I’m surrounded by those who refuse to prep, who think it’ll always be a-OK. A few months a storm went through south Jersey and these same people lost power for a week. Instead of preparing for the storms they do receive (generator, food), they screamed that Chris Christie was the reason they didn’t have power. There was a huge disconnect in the logic in general in that area and not just with those I knew. Here’s a thought – what if all this was just illusion? What is the nature of reality? If we are just experiencing life through the vehicle of our body then does it make sense to panic? why worry about anything if all that will happen is we re-emerge as a higher entity? I agree that it is prudent to prepare as I was in the boy scouts and the old “dib dib dib” still plays in our household. Always prepare for the worst and expect the best, has been our motto for many years, but I wonder, if it all goes south and the military move in, how many will really survive? Just as people are shocked when they find out that uncle so and so is a sexual pervert ? Can’t be. He is so nice. So good. Never did anything wrong. Why do people have a hard time with this ? BTK killer started the coffee pot before church potlucks ! etc.etc. So, …NO ONE believes you when you say something ….wishy washy about someone close. So, there is no support. No belief, No strength. People who do evil are not going to admit it. That is #1 rule !!!! So, that is why so many get away with evil for ever…and pass down the hurt forever. So Sad. Normalcy bias or ignorance ?